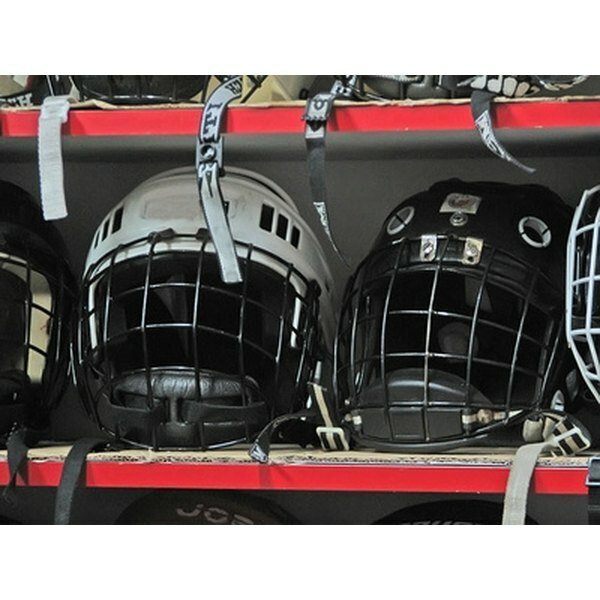 Many hockey players are well acquainted with "hockey smell," the pungent scent of sweat and mildew that builds up in well-used hockey equipment. If not treated with proper ventilation, mold can grow on the insides of gloves, pants, helmets and other gear pieces. Once mold starts to grow, it can be difficult to get rid of; not addressing the situation could cause the player to become sick from a host of mold-related maladies. Don safety equipment like eye goggles, latex gloves and a dust mask to limit your exposure to the mold. Scrape and scrub away all visible evidence of mold from the gear piece in question with your wire brush. Lay the equipment piece in direct sunlight and allow it to sit for several hours in order for the sun to kill mold spores not readily visible to the naked eye. Fill a plastic bucket big enough to accommodate the equipment piece with cold tap water and add about 3/4 cups of white vinegar. Completely submerge the equipment into the bucket. Allow the equipment to soak for at least one hour before removing it. Transfer equipment to a washing machine. Wash the equipment in warm or hot water using a mild detergent. Set the equipment in direct sunlight again to allow it ample time to air dry following the wash. Once dry, spray the gear with a commercial fabric deodorant to eliminate any remaining unpleasant scent. Repeat the process for any remaining moldy gear. If the mold is persistent, take the gear to a professional cleaner to ensure the mold is removed. If the mold cannot be removed completely by you or a professional cleaner, consider destroying the equipment to kill the mold and purchase new gear.